In this article, we'll cover importing an image from the Google container registry into Virtual Labs. Please note that an image can only be pulled into Virtual Labs once. If you attempt to pull an image again, you will simply update the image that has already been pulled. After you click the + button, a dialogue box will appear as pictured below. Enter the name of the image you want to pull in the blue text area, select your container repository from the top dropdown (this should be selected by default) and select your image settings. 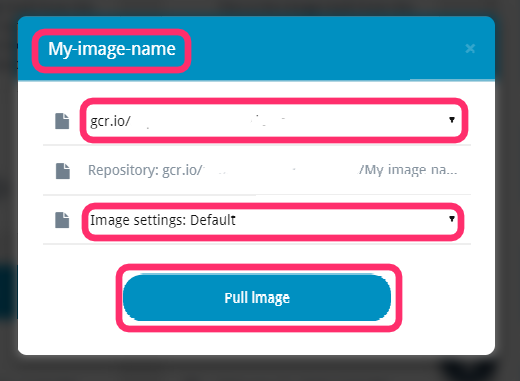 Important note: The image name should not contain the "gcr.io/example-dashboard" prefix (or similar), as it will be added automatically, and should exactly match the name of the image in the repository. 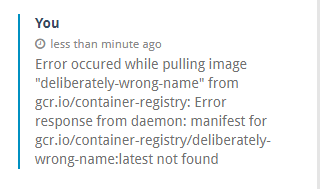 After you click the Pull image button, a new entry ("Pulling image ...") will appear in the Recent image pull request sidebar, indicating that the image you requested is being pulled. At this point just wait; it won't take long! You can now use this image to create admin containers and projects. If the error message you're seeing is different than the above one, and you are unable to determine the cause of the error, please contact our support who will be happy to assist with diagnosing the problem!